Too many enterprise projects still lack sufficient Continuous Delivery pipelines. Sure enough, implementing fully-fledged pipelines — including automated tests, data migrations, rollout as well as rollback functionality — is a complex and demanding task. Enterprises cannot pause revenue-generating projects, just to implement CD. The idea of this course was to split the huge task of introducing Continuous Delivery into practical steps. 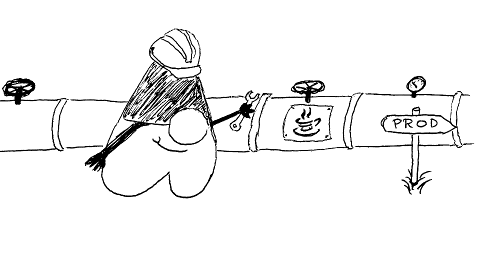 Developers can construct the pipeline while still working on software features. This smoothes the transition. The course contains the distilled knowledge from both experience in numerous enterprise projects and multiple books and articles. While the total runtime isn’t too long, it comprises a certain density of information — you might want to watch an episode several times :-) I believe that this is a feature; saving valuable time and effort for enterprise developers. Usually, the same topics are covered in a 4-day on-site workshop. The course covers both the motivations and concepts as well as example implementations of Continuous Delivery. We’ll look at realistic enterprise scenarios; that is, we’ll be using internal services and servers, rather than GitHub or DockerHub. The covered technologies include Enterprise Java, Maven, Jenkins, Docker and Kubernetes. If you enroll the course until the end of February, you will get two more benefits: an initial 20% discount and a chance to win an autographed copy of my book Architecting Modern Java EE Applications. Have a look a the course overview.